Yakshagana - Episode in Hindi: Rama in Panchavati. Artists from India. Lyrics and music adapted to Hindi, program narration in Hindi with introduction in English. 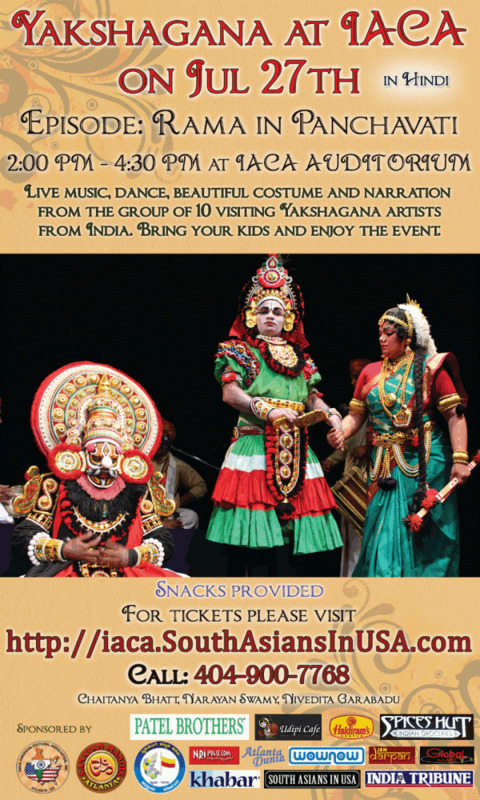 Atlanta, GA: Yakshagana is a theater form that combines dance, music, dialogue, costume, make-up, and stage techniques with a unique style and form. Elaborate and colorful costumes, makeup, and masks constitute some of the most-striking features of the art form. Theatre and Indian culture enthusiasts can now enjoy two Yakshagana performances (in Hindi and Kannada) by the traveling troupe Yaksha Manujsha, in Atlanta. Hosted by India America Cultural Association (IACA), the Hindi performance will be held at the IACA Auditorium on July 27th at 2:00 pm ( www.iacaatl.org for more details). The Kannada performance will be hosted by Nrupathunga Kannada Koota (NKK) on the previous day (July 26th) at the Hindu Temple of Riverdale at 4.00 pm (visit www.atlantakannada.org). With roots in Sanskrit literature and theatre, yakshagana emerged as a form of dance-drama dating back to 10 -16th century A.D. It is one of the few surviving and still most popular art in India, especially in coastal Karnataka and Kerala. Yakshagana depicts holy Ramayana, Mahabharatha or puranas in a colorful dance – drama setting and spreads the message among the common men. The audience merges in devotion and learns the message of love, truth and other valuable attributes. “Kids will have a lasting impact and get to see such elaborate costumes, appreciate music/dance, story telling and cultural immersion imbibing the stories of our legends in their hearts and minds,” said IACA’s Narayan Swamy. In this fast moving modern world, many of the traditions and arts are getting taken away by popular electronic media, movies, news channels etc. But Yakshagana challenges all these and always emerges more popular. Interestingly, it is still growing and there are many Yakshagana troops in coastal Karnataka and many people prefer to watch this noble art without age or creed. Children love Yakshagana because of its colorful costumes and as the drama involves interesting stories. And hence it helps spread our culture and traditions to children easily. In the past few decades Yakshagana has been spreading to other parts of India, including major cities like Mumbai and Delhi. Yakshagana troups have reached many parts of the world and performed in many countries such as USA, Japan, Russia, UK, Middle eastern countries etc.